TASTE was delighted to participate in Tresor Contemporary Craft, which took place from 21 - 24 September 2017 in Basel, Switzerland. In addition to existing artists such as the 2017 LOEWE Craft Prize winner Ernst Gamperl and BBC4 Women’s Hour Craft Prize 2017 finalists Alison Britton & Andrea Walsh, Taste presented, for the first time, artists such as Akiko Hirai, Paul Scott and Elisabeth von Krogh. At Tresor, TASTE also presented work by Paul March and Baldwin + Guggisberg, both of whom featured in Special Projects, a section of the fair that showcased the scale and ambition of craft today while a number of Taste artists were selected for the thematically arranged Curated Spaces. In addition, Director of Taste, Monique Deul, participated in some of the talks held during the event. 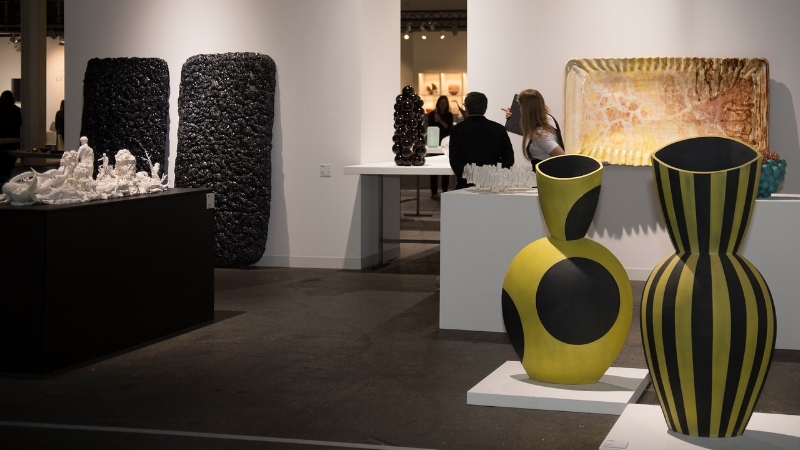 Left to right: Work by Taste Contemporary artists Anne Marie Laureys, Ernst Gamprel, Jeremy Maxwell Wintrebert, Wouter Dam, Barbara Nanning, Michael Brennand-Wood, Susan Nemeth and Paul March at TRESOR Contemporary Craft. Visitors to the Taste Contemporary stand at TRESOR Contemporary Craft enjoying work by Paul Scott, Akiko Hirai, Elisabeth von Krogh, Jeremy Maxwell Wintrebert and Ernst Gamperl. Director of Taste Contemporary, Monique Deul, pictured with Brian Kennedy, Artistic Director of TRESOR Contemporary Craft, at the Vernissage. Work by Elisabeth von Krogh on the Taste stand at TRESOR Contemporary Craft. Work by Taste artists Marit Tingleff [right background] and Elisabeth von Krogh [right foreground] in Curated Spaces at TRESOR Contemporary Craft. Work by Taste artists Baldwin + Guggisberg [foreground] and Paul March [background] featured in Special Projects at TRESOR Contemporary Craft. Director of Taste Contemporary Craft, Monique Deul, participating in one of the talks at TRESOR Contemporary Craft with [left to right] Annie Warburton, Crafts Council UK; Brian Kennedy, Artistic Director of TRESOR and Jorunn Veiteberg, Professor of Curatorial Studies and Craft Curator.. Taste Contemporary at the inaugural TRESOR Contemporary Craft. All images courtesy of TRESOR Contemporary Craft and photography by Uta Grütter.